Dimensions: 4.25" X 7" X 0.75"
Father F.X. Schouppe, S.J. was an eminent theologian of the nineteenth century. 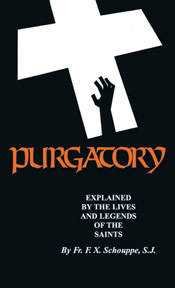 He was the author of Purgatory Explained by the Lives and Legends of the Saints and The Dogma of Hell. His purpose with the latter work, though the subject itself is terrifying, was not to sensationalize or to horrify; but rather to instruct people on the reality of Hell and to excite them to a dread of losing Heaven. The Dogma of Hell was originally published in 1883 by P.V. Hickey, and Purgatory Explained was printed in the late 1800s with the Nihil Obstat and Imprimatur.